The Modko Flip cat litter box gets its name its practical flip-up lid. The lid has a magnetic closure which makes it easy to flip open and shut. Depending on what suits your cat, you can either have the litter box completely enclosed, with the lid half-open or take the lid away completely. The lid also allows you easy acceΒ to the inside of the litter tray for cleaning, whilst the matching scoop attaches to the side of the tray, so it is always to hand when you need to use it. The product includes a useful tarpaulin sheet, that fits inside the litter box (attached with clips), and makes it even easier to change the cat litter. The front entrance to the box measures 20 x 25cm. 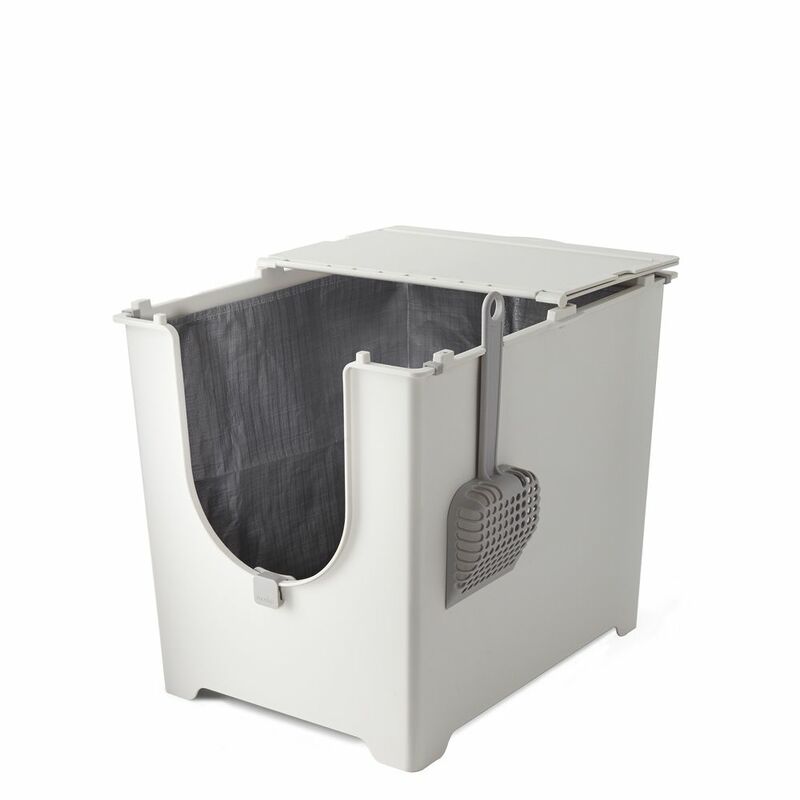 The litter box has very high sides and is made from one complete piece of plastic, to reduce the risk of spillage or litter escaping from the box. This clever litter tray has a modern design to blend into your home environment, whilst maintaining cleanlineΒ and hygiene. Modko Flip Cat Litter Box at a glance: Comfortable and roomy cat litter box with entry from the front 3 in 1 lid: The cover can be left completely open or closed, or half-open Magnetic cover: easy to use, one-handed open and close, to help with cleaning With litter tarp: matching tarpaulin insert, with clips and hooks to attach to the litter box. The tarp helps you to change the litter quickly and easily Litter scoop included: attaches to the side of the litter box so that it is always handy Easy for your cat to get in and out: entry from the front of the box, approx. 20 x 25 cm size entry hole Safe and secure: litter box made of moulded plastic with no joins and high plastic walls, to make it difficult for litter to escape or leak Modern and discreet: to blend into your home environment Material: plastic Colour: white Dimensions: Total dimensions (L x W x H): 52 x 40 x 42. 5 cm Inner dimensions (L x W x H): 47.5 x 36 x 38 cm Entrance: Approx. 20 x 25 cm Entry height: 17cm Scoop (L x W x H): 30 x 12 x 3 cm.